Sometimes I ask to myself why not expanding horizons, why do I have to keep listening to the same artists I love, when the world has a lot of prolific and talented musicians whose work is really worth listening. So my first advice, be open-minded and receive with your ears wide open new music, no matter the name of the band is not familiar. Well, I am saying this because the experience I had with Machine Mass, was great. 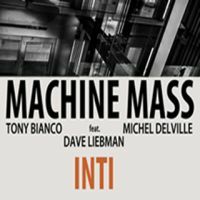 Machine Mass is a trio that features Tony Bianco on drums, Michel Delville on guitar and Dave Liebman on sax and winds, they released this album in early 2014 via Moonjune Records, though it was recorded back in 2012, in an impressive one-afternoon session. In this album we will find great music with a clear jazz fusion orientation, some might say progressive jazz, so if you like this kind of music, I am sure you will have a feast here. The album opens with “Inti” its self-titled track, since the very first seconds you will hear a kind of jam, like a warm up, because after two minutes a new structure begins. Now It with the addition of electric guitar, the music has an experimental touch, though the jazz tunes are still evident. “Centipede” brings more sax in the first seconds, also we can listen to nice bass notes that along with the drums and the late electric guitar creates an intense and delicious jazzy meal that will make you shake your body, and though of course this is not a dancing music, your body will enjoy the rhythm (if there is one) and let the music flow. “Lloyd” has a calmer sound that reminds me of some old-school jazz, because evidently, they are studied and talented guys who have been into this scene for several years. Just to make a reference (not a comparison), in some moments the names of Soft Machine (in its jazziest era) or even Weather Report come to my mind. “In a Silent Way” of course is a tribute to the great Miles Davis. Here Machine Mass uses nice eastern elements accompanied with a not so easy to dig guitar sound that creates a spacey atmosphere, so you might close your eyes and let the music do the rest, you will feel good. “A Sight” starts with hypnotic bass lines and later winds and drums join, so together begin to create a new structure, with a soft rhythm but contrasted with the tension created by the bass. Later the music progresses, the intensity increases and it becomes better and better. “Utoma” is a wonderful jam that has some soundscapes, so the music besides being jazzy, has a prog electronic touch that I liked a lot. I like the drummer’s work, he puts a lot of energy and makes the necessary movements to empower the music, and I like the sax because it never bores me, I mean, it appears only when it has to. “The Secret Place” is a truly different track, here the sound is much, much calmer, relaxing and with the addition of vocals, for the first time in the album. The singer is Saba Tewelde, whose voice is charming. The longest and probably best track comes with “Elisabeth”, in whose 12 minutes one can truly enjoy a mixture of jazz fusion with some electronic loops, experimental and even a Canterbury-esque sound. What I love from this track is that it brings a salad of sounds that made me change my emotions minute by minute, the music is very visual, so one can create images in the head, create a road that has to be driven, so it is our responsibility how to follow that road and how to get to the end. The final track is “Voice” which sums up what Machine Mass offers in the whole album. It is a good progressive jazz experience, fans of music without rules might like this one.